In this study we measured the volume of liquid remaining in the stomach 2-3 hours after ingesting the bowel preparation (GoLytely) and compared it to the gastric volume in patients who took their bowel preparation the evening before. Split bowel preparation is the recommended bowel preparation since it results in better bowel preparation and more complete visualization of the colon mucosa. Some physicians, including many anesthesiology providers, mandate waiting 6-8 hours after the last ingestion of bowel preparation in hopes of decreasing the aspiration risk. This necessitates either asking the patients to wake-up at 2-3 AM or scheduling their procedure in the afternoon. 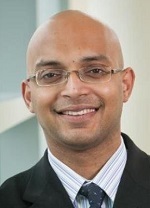 This has limited wide spread adoption of split bowel preparation. Figure 2. 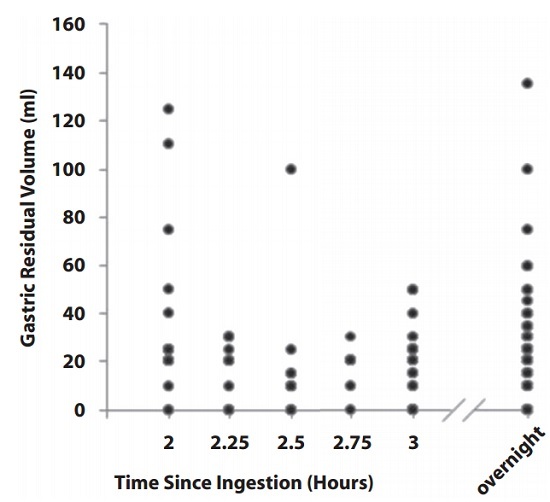 Gastric residual volume in patients 2, 2.5, and 3 hours after ingestion of bowel preparations compared with patients who fasted overnight. Some dots represent multiple patients. In this study, patients who were scheduled to have both upper endoscopy and colonoscopy were asked to drink 4L Golytley the night before and 1L Golytley the morning of colonoscopy. The colonoscopy was performed 2-3 hours after completing the morning dose of GoLytley. There were 75 patients in the split group and 75 patients who completed the bowel prep the evening prior to the procedure. The mean (± SD) GRV in patients receiving split-bowel prep was 21 mL ± 24 mL and for those receiving bowel preparation the evening before and then fasting overnight, was 24 mL ± 22 mL. We also evaluated whether diabetes, gastroparesis or use of opioids might affect GRV. There was no difference in the GRV among those with a history of diabetes (P=.08), gastroparesis (P=.28) use of opioids (P=.62), or those without these comorbidities. There were no sedation related complications and aspiration in any patient. These data support that the physicians need not wait longer than 2 hours after the last ingestion of bowel preparation out of concern for aspiration to proceed with colonoscopy. This will make scheduling easier and also be easier for the patients.